Are you required to present your resume in the bid to secure an internship and you’re having conflicted feelings as to how your resume should look for such internship? Are you scared that you’d be over or under qualified? Do you fall into the above categories or more which hinder you from getting your resume to the appropriate places? Then this article is written especially for you. Writing resumes can be a very tricky affair because your resume is basically an introduction to your employer. So you can be rest assured that first impression matters. Prior to receiving your resume, the recruiter or employer has no knowledge of who you are or your previous achievements as grand as they might be, so always aim not to impress but to express. The recruiter will probably be more interested in getting to know who you are as a person than the things you’ve achieved and there’s a very high probability that it is not a lot given that you’re applying for an internship anyway. A recent study conducted shows that the average recruiter takes a look at a resume for no longer than six seconds and will only look for any longer period of time if the six-second glance was worth it. So kindly look inwards and try to come up with a way to establish a relationship between you and the recruiter in less than six seconds. You’re most probably wondering how on earth it’s possible to do that sort of thing. Well, it is and you’ll learn just how to do it right here. The first thing to do while writing that resume is to look at your previous experiences and check if you’ve done anything related in any way at all to the work you’re currently trying to apply for. If you’re applying for an internship at a digital marketing agency, then you should be looking out for any experience in a field such as social media management. Look for times where you have handled any social media account for any brand, even if it’s a personal one and turn it into a corporate experience. 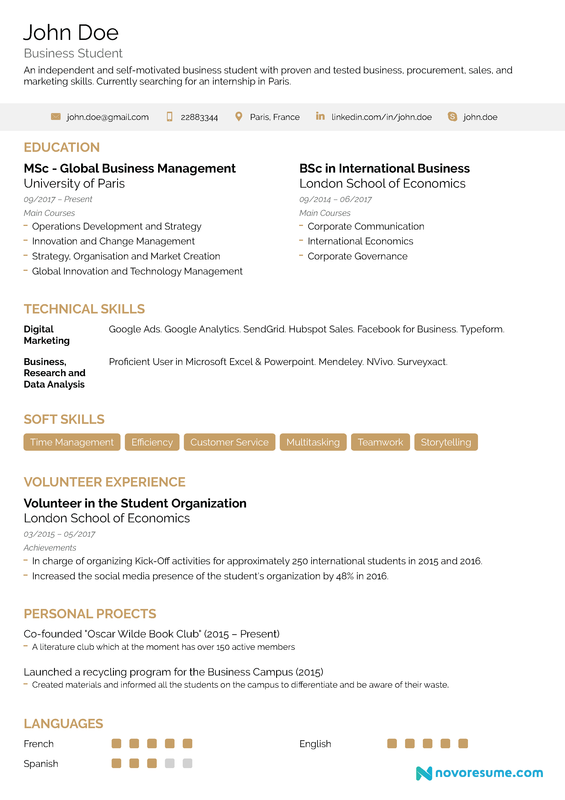 While writing your resume for an internship, you can be rest assured that the recruiter or company does not expect you to have serious professional qualifications and your current qualifications are only expected to boost your academic or career goals, hence you can totally include all those skills you gained on your own and show willingness to gain more skills. It should perfectly highlight your strengths and be appropriately structured. There is absolutely no need for preambles so you should go straight to the point and make the position you’re applying for very obvious. Avoid errors and make your resume very easy to read. Above all, make sure that your resume isn’t more than one page. Reiterating the above, the recruiter does not expect you to have tons of experience but that does not give you the permission to fill up your resume with generic information as it sends a very bad message to the recruiter about you. Also, keep it in mind that your recruiters are looking for someone who has skills that are honed personally through practice and very willing to learn. Skills such as; the ability to work under pressure and meet target deadlines, a very high level of creativity, impressive communication skills, hard work and exceptional leadership abilities. It is very common while writing a resume for internships to see many students stressing or having a meltdown because of their GPA. If you’re in that category, then you need to take a step back and desist from giving yourself a high blood pressure because, in actual fact, recruiters in most cases usually do not take the school GPA into cognizance or let it determine if you deserve to be recruited or not. Although always make sure to include your academic qualifications as poor as they might be on your resume because for someone in your stage, you might not possess enough field experience and as I said before, even recruiters do not expect you to. Recruiters are usually more interested in relevant work experiences so kindly focus more on that. On your resume, there are basic things that should attack your recruiter first, and one of them is your 'Professional Summary' which is where you tell your recruiter what you have got to offer in just a couple of sentences. Always make sure that you do not turn in a resume without a professional summary as that’s the best way to let your employer know what you’re good for or at. Your resume should be tailored to fit the position you’re applying for, as this gives the recruiter the idea that you’re already a nice fit for their company even long before you’re offered a position. You should also never forget to include all the awards and honors you’ve received as little as they might be, they go a long way in creating a lasting impression in the mind of your employer and give you an edge of credibility over other resumes. With all the above insights, you should be well on your way to securing that dream internship, without an atom of doubt that you can be absolutely sure of.